Want to pretend with me for a minute or two? 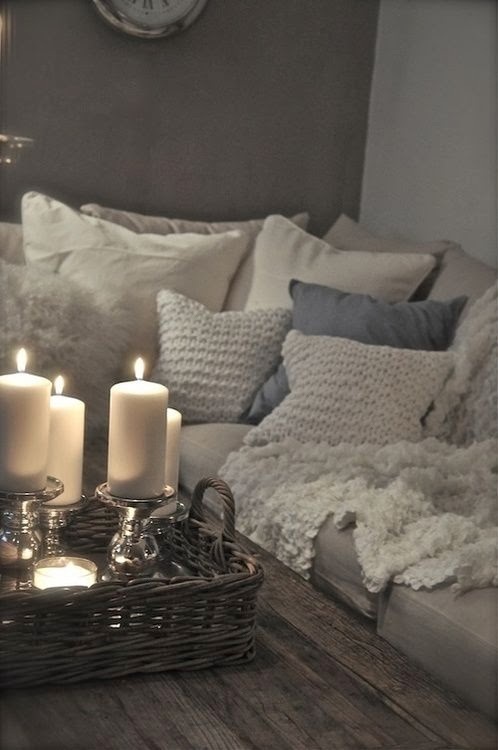 Let's sit on my pretend sofa and sip on something warm. Let's just talk about whatever is going on in our lives. Let's really listen to each other. There are so many times in our lives that we forget to just exhale and take in something for just ourselves. We're running around doing this and that - crossing off things on our to-do list - working our lives until we fall into bed and pass out. It gets tough, doesn't it? I know that if I'm not that busy - with the family, work, going to school, my homework - I'd go a bit crazy. I need to fill my time so that my mind doesn't wander. I guess you could say I live off the go-go-go day-to-day. It's because I don't like the way my mind wanders into places I don't always like to go. So I'm here to tell you that I'm a tiny bit scared that I have to take vacation days tomorrow and Monday. See, I'm capping off on my vacation accruals at work and if I don't take them now, I'll lose vacation hours. So, I'm on a mandatory time-out so to speak. You're probably thinking - "Great! I'd love to be forced to take a day off or two. What are you complaining about?" The thing is I have issues with being alone. I'll be home and get some chores done - you know, things to keep my mind busy - and then, I'm at a loss. It used to be sheer terror for me to be alone. I'd take a sleeping pill or two so that I could sleep out the day. But that is not healthy. So, slowly I've started putting a grasp on days off for myself. With no kids because they're at school, the husband at work - so it's just me, myself & I. Tomorrow and Monday - I have no plans. Maybe grab lunch with the hubby during his lunch break? Go to Starbucks or something and study...or write some more stories about Penelope? Pick up my mom so she can sleep over? I have no idea...maybe I'll just do nothing and be with myself. Take little steps to being okay with that. Thank you for listening, lovey. Again, I took over the conversation...but, what would you have wanted to talk about? Use the comments to let it all out. That's what friends are for, right? Please drop me a line while you take a minute of your day to exhale.